For other uses, see Super League (disambiguation). Super League (currently known as the Betfred Super League for sponsorship reasons) is the top-level professional rugby league club competition in the Northern Hemisphere. The league has twelve teams: eleven from England and one from France. Super League began in 1996, replacing the Rugby Football League Championship and switching from a winter to a summer season. Each team plays 29 games between February and September: 11 home games, 11 away games, Magic Weekend and an additional 6 'loop fixtures' decided by league positions. The top five then enter the play-off series leading to the Grand Final which determines the champions. The bottom team is relegated to the Championship. The Super League champions play the National Rugby League champions from Australasia in the World Club Challenge at the start of the season. They were to be included with the following stand-alone clubs: Bradford Northern, Halifax, Leeds, London Broncos, Paris Saint-Germain, St. Helens and Wigan. However this proved so unpopular that only existing clubs were selected for the competition. The clubs finishing below 10th in the existing top flight were excluded, which meant Featherstone Rovers, Hull, Wakefield Trinity and Widnes were left out, as were pioneering club Keighley who had just won the Second Division Championship. London Broncos, who had come fourth in the Second Division, were "fast-tracked" in on commercial grounds. A new team, Paris Saint-Germain, was created to give a French dimension. Between 1998 and 2000 there was no relegation from Super League. After two years Paris were dropped from the competition. Promotion and relegation between Super League and the Rugby League National Leagues was re-introduced, and in 2002 the Super League Europe (SLE) governing body re-integrated fully into the Rugby Football League (RFL). In 2006, French side Catalans Dragons (also known as UTC or Les Catalans) from Perpignan joined the league, becoming the second non-English team to compete. To facilitate this move, two clubs were relegated from Super League at the end of the 2005 season: Leigh who finished bottom of the league were replaced by the one club coming up from the National Leagues and Widnes who finished 11th (and would have stayed up any other year) were dropped for Les Catalans, thus the number of clubs in Super League remained at 12. Super League licences were announced in May 2005 by the RFL as the new determinant of the Super League competition's participants from 2009 in place of promotion and relegation. The licences were awarded after consideration of more factors than just the on-the-field performance of a club. After 2007 automatic promotion and relegation was suspended for Super League with new teams to be admitted on a licence basis with the term of the licence to start in 2009. The RFL stated that clubs applying to compete in Super League would be assessed by criteria in four areas (stadium facilities, finance and business performance, commercial and marketing and playing strength, including junior production and development) with the final evaluations and decisions being taken by the RFL board of directors. Successful applicants were licensed for three years of Super League competition and three-yearly reviews of Super League membership took place to ensure ambitious clubs lower down the leagues can still be successful. Points attained by each club's application are translated into licence grades A, B or C. Clubs who achieved an A or B Licence would be automatically awarded a place in Super League, while those who achieved a C Licence underwent further scrutiny before the RFL decided who made the final cut. In June 2008, the RFL confirmed that Super League would be expanded from 12 teams to 14 in 2009, and on 22 July 2008 the RFL confirmed the teams awarded licences. The teams announced were the 12 existing Super League teams along with National League 1 teams, Celtic Crusaders and Salford. Celtic Crusaders becoming the first Welsh team to play in Super League and the only team to be awarded a licence who had never played in the Super League previously. Featherstone Rovers, Halifax, Leigh and Widnes all failed to attain a licence. Leigh and Widnes, especially, were disappointed with their exclusions with Leigh's chairman being extremely critical of the RFL. For the 2012–14 seasons Championship sides Batley, Barrow, Featherstone Rovers, Halifax and Widnes all met the on-field criteria needed to submit an application, but despite this only Barrow, Halifax and Widnes decided to submit an application. On 31 March 2011 Widnes were awarded a Super League licence; Barrow, did not meet the criteria and were refused a licence; and Halifax's application was to be further considered alongside the other Super League clubs. The Rugby Football League's final decision was announced on 26 July 2011, Widnes would be joining thirteen existing Super League teams with Crusaders RL having withdrawn their application and Halifax not meeting the criteria. Crusaders CEO Rod Findlay stated that the club's finances were not in a good enough condition to justify their place in Super League. Halifax chairman Mark Steele was critical of the decision to award Wakefield a licence over themselves, saying "If you compare Belle Vue with the Shay, it's no contest; if you compare playing records, it's no contest; and if you compare the financial position, we have kept our head above water and they haven't." Wakefield had been favourites to lose their licence before Crusaders' withdrawal. At the 2013 Annual General Meeting at Bradford, the Super League clubs agreed to reduce the number of clubs to 12 from 2015, and also for a return of Promotion and Relegation with a 12 club Championship. The top 8 Super League clubs will continue to compete in the Super 8s. After playing each other once (either home or away), the top 4 clubs will progress to the semi-finals to determine who will compete in the Grand Final and be crowned champions. The remaining (bottom 4) Super League clubs and the top 4 Championship clubs will compete in The Qualifiers. They will play each other once (either home or away) to determine which four of the clubs will compete in Super League the following year. Funding for clubs will be tiered in both leagues to prevent relegation related financial difficulties. In June 2015 8 of the 12 Super League clubs voted to allow a Marquee Player that can exceed a clubs salary cap as long as they can afford their wages. The marquee player rule came into force for the 2016 Super League season. Super League proposal: The Super League proposed staying with 12 teams who play each other home and away plus Magic Weekend and 6 loop fixtures (29 games). They also proposed a return to a top-5 playoff and the 12th placed team being relegated. Championship & League 1 proposal: The alternative proposal was that Super League would expand to 14 clubs playing 27 games ending with a top-5 playoff. The team finishing 14th would be relegated and 13th would play 2nd, 3rd and 4th in the Championship in a relegation playoff. After a vote, the Super League proposal was voted through and is due to be implemented for the 2019 season. 12 teams compete in Super League. They play each other twice on a home-and-away basis, interrupted by the Magic Weekend round in May. The 12 clubs also play 6 loop fixtures to bring the number of games in a season to 29. The team finishing bottom after 29 rounds collects the Wooden Spoon, while the team finishing first is awarded the League Leaders Shield. The top 5 teams at the end of the season enter the playoffs. Super League will be adopting Golden point during regular season for the first time as of the start of the 2019 season, bringing it in line with the NRL which has been using the system since 2003. In an attempt to expand out of the traditional rugby league "heartlands", and market the game to a wider audience, the RFL has staged games in large stadia, in places without a strong rugby league presence. The "Magic Weekend" concept, which involves staging an entire round of Super League in such a stadium, was first staged in Cardiff in 2007. Dubbed "Millennium Magic", and played in the Millennium Stadium, the concept was held in Cardiff again in 2008. In 2009 and 2010, the event was held in Edinburgh at the Scottish national rugby union stadium, giving rise to the name changing to "Murrayfield Magic". Generally held during the May Day weekend, 2011 saw the Magic Weekend return to Cardiff, and was held during the weekend 12–13 February, and serving as the season opener. from 2014-2018, the event was held at St James' Park in Newcastle. In 2019, the event will be held at Anfield in Liverpool. The current play-off system was previously used between 1998 and 2001. The same system was used in the NSWRL's Sydney Competition 1973-1994, the Australian Super League in its only season 1997, the VFL, 1972–1990 and New Zealand's Lion Red Cup, 1994–1996, and Bartercard Cup, 2000-2006. From week two on the Top five play-offs system reflected exactly the Page playoff system. The Challenge Cup is a separate cup competition, involving clubs from Super League and all levels of rugby league in Britain. It has been held annually since 1896 and has been expanded so teams in Russia, France, Scotland and Wales can take part. The cup runs throughout the season, and the final is usually played on the August bank holiday at Wembley Stadium. In 2014 and 2015 Super League clubs were unhappy with the Dual registration system and wanted to form an under-23 reserve leagues between the under-19s and first teams. Wigan, Warrington and St Helens were the first teams to propose the return of the reserve league where players could move from the under 19s and play with professional players before playing in the first team. A reserve league was set up in 2016 with a mixture of Super League, Championship and League 1 teams. Dual registration refers to an arrangement between clubs whereby a player continues to be registered to his current Super League club and is also registered to play for a club in the Championship. The system is aimed at young Super League players who are thought to be not quite ready to make the step up to 'week in, week out' Super League first team duties but for whom first team match experience is likely to be beneficial for their development. Only Super League players can be dual registered and the receiving club must be a club in the Championships, meaning that Super League to Super League club dual registrations are not available. A dual registered player will be eligible to play and train with both clubs in a format agreed between the clubs, subject to registration, salary cap and competition eligibility rules. The player is restricted to playing in one fixture per scheduled round of fixtures in any given week and would not be eligible to play for his Super League club on a Thursday and in a Championship fixture at the weekend, for example. A receiving club will be limited to a total of five dual registered players per matchday squad. See Rugby Football League Championship for the all-time list of champions since 1895. The league format changed in 1998 and the championship became a play-off series to determine the Super League champions. This meant a reintroduction of a final to determine the European champions, the first since the 1972–73 season. In rugby league, the term 'the Double' is referring to the achievement of a club that wins the top division and Challenge Cup in the same season. To date, this has been achieved by a total ten different clubs but by only four different clubs during the Super League era. The Treble refers to the team who wins all three domestic honours on offer during the season; Grand Final, League Leaders' Shield and Challenge Cup. To date seven teams have won the treble, only Bradford Bulls, St. Helens and Leeds Rhinos have won the treble in the Super League era. Winning all Four Cups refers to winning the Super League, League Leaders' Shield, Challenge Cup and World Club Challenge in one season. Not all of these cups were available in the past but have replaced other cups that could be won. The League Leaders' Shield is awarded to the team finishing the regular season top of Super League; this is also known as a minor premiership. The League Leader's Shield was introduced only in 2003, previously no prize was awarded to the team finishing top following the introduction of the Grand Final. The winner of the Grand Final is given the Super League Trophy as Super League Champions. This is considered more prestigious than the minor premiership. Each year, the year of a champion team's triumph, team name and team Rugby league football captain are engraved. The record for most Super League titles won is held by Leeds with eight titles. Leeds captain Kevin Sinfield currently holds the record for captaining the most Super League title winning sides after captaining Leeds to their first 7 grand final successes. 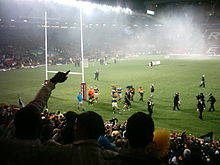 St. Helens contested the final 6 years in a row (from 2006 until 2011) during which time they succeeded only once in lifting the trophy against Hull F.C. in 2006; after which they suffered consecutive defeats against Leeds in 2007, 2008, 2009, Wigan in 2010 and Leeds once again in 2011. However, St. Helens made a victorious return in 2014, defeating rivals, Wigan 14–6. Following their 2014 and 2015 defeats to St. Helens and Leeds respectively, Wigan have now equalled St Helens's record of losing five Grand Finals. Hull FC (2006), Warrington (2012, 2013, 2016, and 2018), and Castleford (2017) have all appeared in the Grand Final but never won. The Man of Steel Award is an annual award for the best player of the season in Super League. It has continued from pre-Super League times, with the first such award given in 1977. It was renamed in honour of Steve Prescott in 2014. The Albert Goldthorpe Medal is an award voted for be members of the press who cast a vote after every game of the regular season. The three players who, in the opinion of the reporter, have been the three 'best and fairest' players in the game will receive three points, two points and one point respectively. To be eligible for a vote, a player must not have been suspended from the competition at any stage during the season. The Super League has been won by 13 different coaches, 8 from Australia, 4 from England and 1 from New Zealand. Statistics are correct as of October 2018 (end of Super League XIII). 10 players have captained teams to win the Super League. The Super League has had two official logos. The first was used for the inaugural season in 1996 and until 2016. The logo had the Super League S with Super above it and League below it. The title sponsors name would appear above the logo until 2014 when title sponsors First Utility used their own personalised logos that appeared on player shirts and in the media. The reigning champions had a ribbon around the logo with champions on it until 2011. The second official logo was introduced in 2017 as part of a radical rebrand across British rugby league. The design was similar to the RFL and England logos. It had a rectangular backdrop representing the George Hotel, where rugby league was founded, thirteen lines representing thirteen players, a chevron which are well known for appearing on rugby league shirts and the S which represents the ball and the Super League. The current champions have a gold logo. Super League has been sponsored since its formation, apart from the 2013 season. As well as title sponsorship, Super League has a number of official partners and suppliers. For the 2017 season these include Kingstone Press Cider, Dacia, Foxy Bingo, Batchelors and Specsavers. The official rugby ball supplier is Steeden. An overseas quota restricting the maximum number of foreign players at each club has existed since the inception of the Super League in 1996. However, overseas players that hold a European Union passport or come under the Kolpak ruling do not count towards the quota. This resulted in the number of non-British players at some clubs greatly exceeding the quota. In response to concerns over the growing number of foreign players in the league, in 2007, the RFL announced plans to introduce a "homegrown player" rule to encourage clubs to develop their own players. As of 2017, Super League clubs are permitted to register no more than five overseas players. Additionally, squads are also limited to a maximum of seven non-Federation trained players. A salary cap was first introduced to the Super League in 1998, with clubs being allowed to spend up to 50 percent of their income on player wages. From the 2002 season onwards, the cap became a fixed ceiling of £1.8 million in order to increase parity within the league. The combined earnings of the top 25 players must not exceed £1.825 million. Clubs will only be allowed to sign a new player if they have room under the cap. Clubs are allowed to spend a maximum of £50,000 on players outside the top 25 earners who have made at least one first grade appearance for the club during the year. Costs for players outside of the top 25 earners who do not make a first team appearance will be unregulated. Any player who has played for the same club for at least 10 consecutive seasons will have half their salary excluded from the salary cap for his 11th and subsequent seasons. This is subject to a maximum of £50,000 for any one club. Clubs are allowed one "Marquee Player" who can exceed a club's salary cap as long as they can afford the players wages. In 2017, Super League clubs approved proposals to increase the salary cap over the next three seasons, eventually rising to £2.1 million by 2020. Clubs will also be allowed to sign a second marquee player. Before each Super League and Tetley's Challenge Cup fixture, each club must announce the squad of 19 players it will choose from by 2.00pm on the second day before the match day. All Super League matches are governed by the laws set out by the RFL; these laws are enforced by match officials. Former Super League and International Referee Steve Ganson is the current Head of Match Officials and Technical Director. Former Hull F.C. player and Huddersfield Head Coach Jon Sharp was the previous Head of Match Officials. Sharp was sacked in July 2015 and took up the role of Head Coach at Featherstone Rovers. He assumed his role at the RFL following Stuart Cummings' departure in March 2013 having previously held the role of Match Officials Coach & Technical Director. Since its formation in 1996 only four teams have won the Super League (Bradford Bulls, Leeds Rhinos, St. Helens and Wigan Warriors). Also, only a total of seven teams have taken part in the Grand Final (Hull FC, Castleford and Warrington Wolves being the other three). Seven different teams have been the league leaders, however only one of these (Huddersfield Giants in 2013) is a different team to those that have appeared in the grand final, meaning that only eight different teams have been involved in the grand final or topped the regular season table, however, a total of 23 teams have taken part in Super League since its inception. In comparison, in the same 22-year period, 12 different teams have won the Australasian National Rugby League competition and 15 different teams have appeared in the Grand Final. Between 2009 and 2014 teams had to apply for a license to play in Super League, this also meant there was no automatic promotion between Super League and the Championship. This was unpopular with Championship clubs because there was no fair and easy way for them to get promoted into Super League and it was seen as a closed shop. Attendances in the lower divisions dropped as a result of this system because it was felt that there was little appeal in these leagues when there was no incentive for the clubs to win the Championship. Also the only time that lower division clubs got the chance to play Super League opposition was in the early rounds of the challenge cup. With no route to the Super League however, teams were unable to compete with top division opposition because there was no way that clubs could attract top talent when players would not be playing in top-level rugby league. Another Criticism of the Super League is that most of the teams that have competed in it have been in its heartlands of the M62 Corridor between Yorkshire and Lancashire. Catalans Dragons are the only team currently playing in Super League who are outside its traditional headland in the North of England and are considered a success compared to teams such as London Broncos and Celtic Crusaders. Expansion was a key policy of the RFL when Super League was created. Along with the above-mentioned teams, Paris Saint-Germain RL competed from the beginning of the competition but departed after just two seasons due to a lack of interest and investment. Another team to fail from outside the heartlands was Gateshead Thunder who competed in the first season of Super League. After that first season they found themselves with debts of £700,000 and so accepted a grant of £1,250,000 to merge with Hull FC. Expansion has taken place in the lower divisions and this is a continuing policy of the RFL. At present nine expansion clubs take part in the lower divisions with 1 in the Championship and 8 in the Championship 1. In 2015, it was announced that Toulouse Olympique had been granted entry into League 1, the third division of European rugby league; the team has previously competed in the Championship. This brought the total number of expansion teams across the top 3 divisions to 10 (out of 39 clubs). In 2016 it was announced that a team based in Toronto, Canada had also been granted access to League 1. Toronto Wolfpack will begin play in the 2017 season and will take the number of expansion clubs to 11 (out of 40 clubs). This also means that teams taking part in the top 3 divisions will come from 4 countries and 2 continents. Sky Sports have been the primary broadcast partner of Super League since its inaugural season in 1996. The current deal lasts until 2021 and covers 80 matches per season, rising to 100 from 2015. They currently have the rights to show live Super League games in both Ireland and the United Kingdom; two live matches are broadcast each week – one on Thursday nights at 7:30pm (kick off 8pm) and another at 7:30pm on Friday nights (kick off 8pm). From 2014, they also simulcast all of Catalans Dragons' home games and from 2015, will broadcast regular Kingstone Press Championship matches. Super League Thursday starts at 7:30 pm and consists of a preview of the weekends Super League fixtures before the first game of the weekend. Super League Friday includes one game with coverage starting at 7:30pm building up to the game. Super League Saturday usually shows Catalans Dragons games kicking off at 5:00pm with coverage starting from 4:55pm. When the Super 8s begging other teams are shown with coverage starting at 2:30pm for games kicking off at 5:00pm. In addition to Sky Sports' live coverage, BBC Sport broadcast a weekly highlights programme called the Super League Show, usually presented by Tanya Arnold. This is broadcast to the North West, Yorkshire & North Midlands, North East & Cumbria, and East Yorkshire & Lincolnshire regions on BBC 1 on Monday nights (after 11pm) and is repeated nationally on BBC 2 on Tuesday afternoons. A national repeat was first broadcast overnight during the week since February 2008 when the then BBC Director of Sport, Roger Mosey, commented that this move was in response to the growing popularity and awareness of the sport, and the large number of requests from people who want to watch it elsewhere in the UK. The end of season play-off series is shown nationwide in a highlights package. The Super League Show is also available for streaming or download using the BBC iPlayer in the UK. Regular commentator is Eddie Hemmings and formerly Mike Stephenson with summarisers including Phil Clarke, Brian Carney, Barrie McDermott and Terry O'Connor. Live Super League broadcasts regularly rank amongst the top 10 most watched programmes in a week on Sky Sports with in excess of 250,000 viewers. Sky Sports also run several supplementary magazine shows, including Super League Full Time and Boots N' All. Premier Sports and Made in Leeds show a rugby league magazine program called Rugby AM hosted by Alex Simmons, Jamie Jones Buchanan and Keith Senior. It is aired on a Thursday night at 7 and is also repeated on Saturday. Rugby AM also has a radio show on All Star FM. Internationally Super League is shown live by eight different broadcasters in eight different countries and regions. Talksport is an official broadcaster of Super League, broadcasting commentaries and magazine programming on Talksport 2. BBC Radio 5 Live Sports Extra covers more than 70 Super League games through 5 Live Rugby League each Thursday and Friday night. Each 3 hour programme is presented by Dave Woods with a guest summariser (usually a Super League player or coach) and in addition to live commentary also includes interviews and debate. A 5 Live Rugby League podcast is available to download each week from the BBC website at http://www.bbc.co.uk/programmes/p02nrtxd/episodes/downloads. BBC Radio Manchester Salford, Wigan and Warrington. BBC Radio Merseyside St Helens, Warrington and Widnes. Radio Yorkshire cover two matches per round featuring Yorkshire clubs. BCB 106.6 (Bradford Community Broadcasting) have full match commentary on Bradford home and away. Wish FM have full match commentary on Wigan and St Helens matches home and away. Wire FM have full match commentary of Warrington amatches home and away. Grand Sud FM covers every Catalans Dragons Home Match (in French). Radio France Bleu Roussillon covers every Catalans Dragons Away Match (in French). All Super League commentaries on any station are available via the particular stations on-line streaming. ESPN3, formerly ESPN360, has had worldwide broadband rights since 2007 when they broadcast the 2007 Grand Final. Since 9 April 2009, all of the matches shown on Sky Sports have also been available live online via Livestation everywhere in the world excluding the US, Puerto Rico, UK, Ireland, France, Monaco, Australia and New Zealand. In 2016 Livestation shut down, however these matches are also available online for UK users only through Sky Go and Now TV. In the United Kingdom, a number of commercial radio stations, along with BBC Radio 5 Live Sports Extra and the local BBC radio stations simulcast commentary of Super League games on the internet. Additionally, the 5 Live Rugby League podcast is available to download each week from the BBC website at http://www.bbc.co.uk/programmes/p02nrtxd/episodes/downloads. ^ a b BBC Sport (19 May 2005). "Super League set for 2009 changes". BBC. Retrieved 18 July 2008. ^ a b RFL. "Licensing". The Rugby Football League. Archived from the original on 2 May 2008. Retrieved 18 July 2008. ^ BBC Sport (22 May 2005). "Franchise system 'is way forward'". BBC. Retrieved 18 July 2008. ^ Angela Powers. "Licence to thrill". Sky Sports. Archived from the original on 25 March 2008. Retrieved 18 July 2008. ^ Gary Slater (18 June 2008). "Super League to expand to 14". London: Telegraph.co.uk. Retrieved 18 July 2008. ^ Sky Sports (17 June 2008). "Super League set to expand". Sky Sports. Retrieved 18 July 2008. ^ BBC Sport (16 July 2008). "Clubs confident over franchises". BBC. Retrieved 18 July 2008. ^ Ian Laybourn. "Leigh blast for Super League". Sporting Life. Archived from the original on 5 June 2011. Retrieved 18 August 2008. ^ BBC Sport (8 October 2010). "Five clubs in Super League queue". BBC. Retrieved 7 August 2011. ^ BBC Sport (3 December 2010). "Widnes, Halifax and Barrow meet Super League deadline". BBC. Retrieved 7 August 2011. ^ "Vikings awarded Super League licence". Super League Official. 31 March 2011. Archived from the original on 10 September 2012. Retrieved 7 August 2011. ^ "Thirteen Super League licences awarded for 2012 to 2014". RFL. Retrieved 7 August 2011. ^ a b c BBC Sport (26 July 2011). "Crusaders withdraw application for Super League place". BBC. Retrieved 7 August 2011. ^ Super League to become a 12-team competition from 2015. Superleague.co.uk (11 July 2013). Retrieved on 20 August 2013. ^ "Super League: Competition restructures confirmed". 17 January 2014. Retrieved 25 January 2017 – via www.bbc.com. ^ BBC Sport (2018-11-19). "Super League: Golden-point extra time introduced for regular season from 2019". BBC Sport. Retrieved 2018-11-19. ^ Wilson, Andy (9 February 2013). "Debate continues over Super League and Championship dual registration". Retrieved 25 January 2017 – via The Guardian. ^ "Match Centre - Rugby-League.com". Retrieved 25 January 2017. ^ Hadfield, Dave (24 January 1996). "Tries to be given trial by television". The Independent. Retrieved 4 July 2017. ^ Hadfield, Dave (5 February 2007). "Overseas quotas on clubs' agenda". The Independent. Retrieved 4 July 2017. ^ "Operational Rules". The Rugby Football League. Retrieved 4 July 2017. ^ Fisher, Michael (12 January 2001). "Salary cap to be squeezed to £1.8m". Telegraph. Retrieved 6 July 2017. ^ Bower, Aaron (5 April 2017). "Super League clubs vote for salary cap rise and second marquee player". The Guardian. Retrieved 6 July 2017. ^ "BBC Super League Show: New series starts on 10 February". 7 February 2014. Retrieved 25 January 2017 – via www.bbc.co.uk. ^ "Triline Sports". Triline Sports. Archived from the original on 23 September 2006. Retrieved 18 June 2007. ^ "Super League: BBC Radio 5 live sports extra to air new show". 4 February 2014. Retrieved 25 January 2017 – via www.bbc.co.uk. Caplan, Phil; Doidge, Jonathan R. (2006). Super League – the first ten years. The History Press Ltd. ISBN 978-0-7524-3698-2.